** Planetary rover update: January 22, 2019 | Behind The Black – Bob Zimmerman reports on the status and plans for the Mars rovers and the Chinese Yutu-2 rover on the Moon. Since November Curiosity has remained on the top of Vera Rubin Ridge, where it drilled its third successful hole there, out of a total of six drilling attempts. The failures were partly because of the hardness of the rock on the ridge, and partly because they are using a new drilling technique because of the failure of the drill’s feed mechanism. Instead of having the feed mechanism push the drill down into the rock, they use the robot arm itself. This has required care because the last thing they want to do is damage the arm itself. The image [below] shows where Curiosity is heading in next year or two and was discussed in detail in my December 19, 2018 post, Curiosity’s future travels. ** Planetary Scientists Continue to Puzzle Over the Mysterious Slope Streaks on Mars. Liquid? Sand? What’s Causing Them? – Universe Today – Investigations into what causes the long streaks down the sides of hill and mountain slopes on Mars. Since they were first observed in the 1970s by the Viking missions, the slope streaks that periodically appear along slopes on Mars have continued to intrigue scientists. After years of study, scientists still aren’t sure exactly what causes them. While some believe that “wet” mechanisms are the culprit, others think they are the result of “dry” mechanisms. Luckily, improvements in high-resolution sensors and imaging capabilities – as well as improved understanding of Mars’ seasonal cycles – is bringing us closer to an answer. Using a terrestrial analog from Bolivia, a research team from Sweden recently conducted a study that explored the mechanisms for streak formation and suggest that wet mechanisms appear to account for more, which could have serious implications for future missions to Mars. 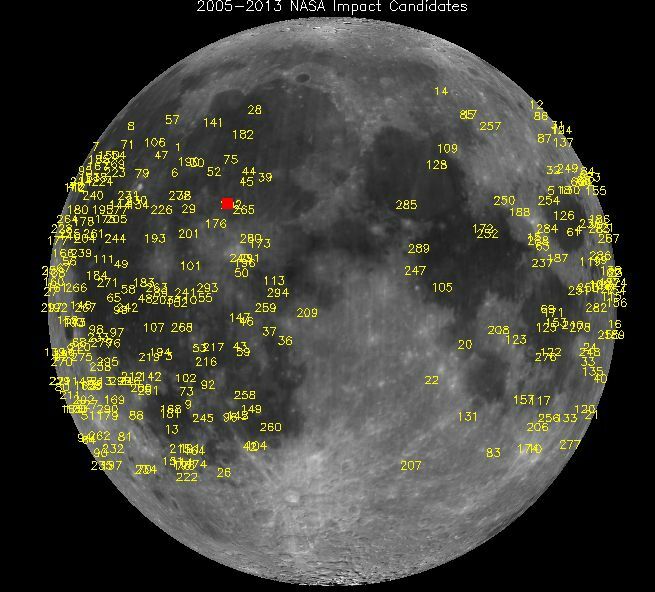 These images correspond to a lunar impact flash spotted by the telescopes operating in the framework of the MIDAS survey on Jan. 21, at 4:41:38 universal time (23:41:38 US eastern time). The impact took place during the totality phase of the lunar eclipse. The flash was produced by a rock (a meteoroid) that hit the lunar ground. The MIDAS Survey is being conducted by the University of Huelva and the Institute of Astrophysics of Andalusia. Meteoroids hit the Moon all the time. Literally. NASA has been observing the impact flashes since 2005. Recently, other groups in Europe have joined the hunt. Flashes are typically observed once every 2 or 3 hours of observing time. Impactors range in size from softballs to boulders, liberating energies equal to tons of TNT when they strike. The rare thing about this strike is that it was photographed during a full Moon, when lunar glare usually overwhelms the glow of any fireball. During the eclipse, Earth’s shadow turned lunar day into almost-night for an hour, allowing the fireball to be seen.